Son of famous Alfredo Vilchis, brother of Hugo and Luis Vilchis. 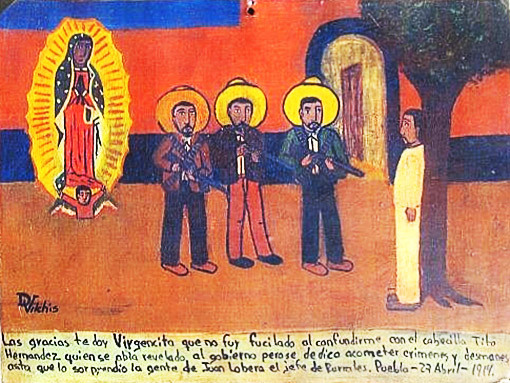 I dedicate this retablo to the Virgin of Guadalupe in the name of all women in the world for those cowardly murdered in Ciudad Juarez, Chihuahua. With sadness in my heart, I ask you, My Mother, to accept their souls to the heaven, for the comfort of their families. 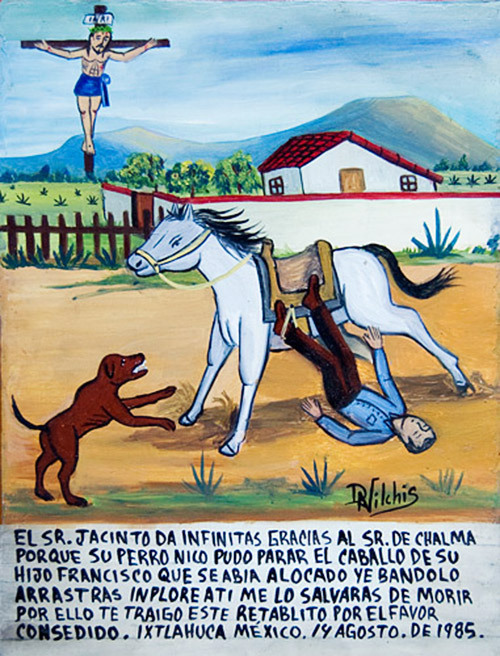 Sr. Jacinto gives infinite thanks to the Lord of Chalma because his dog Nico could stop his son Francisco’s horse that went crazy and ran dragging his son. I prayed you, and you saved him from dying. 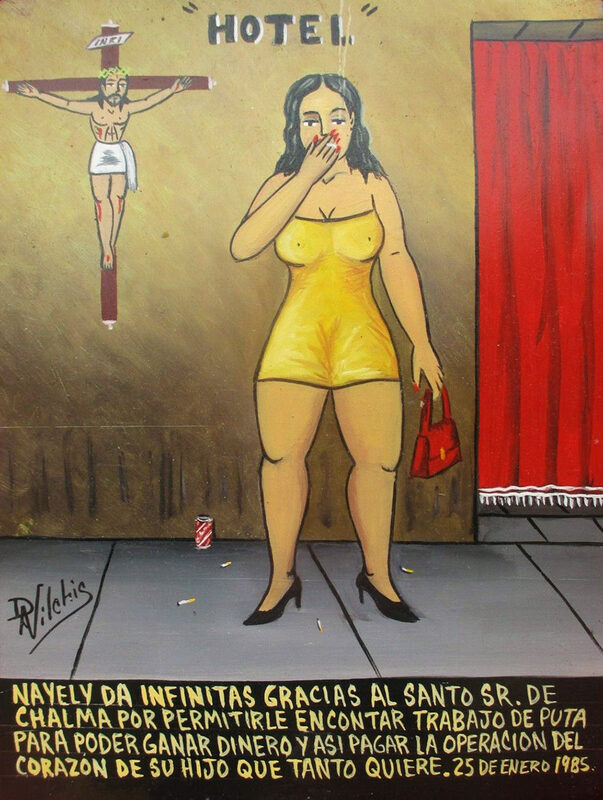 I bring you this retablo thanking for this favor. 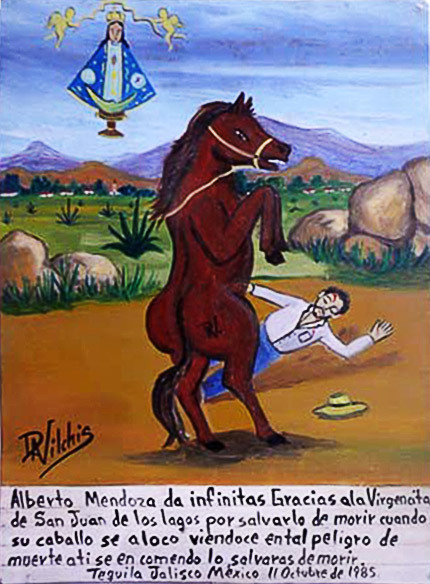 The boy Alejandro Hernandez gives thanks to the Virgin of Guadalupe because Mistico won over Averno. He thanks also his father because he bought him the Mistico’s mask which he wanted so much. 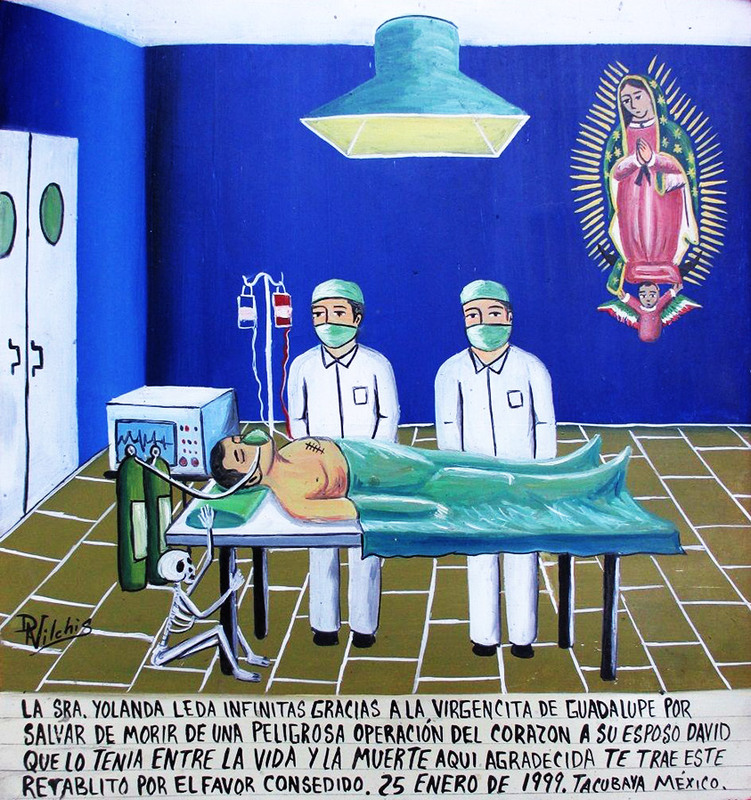 Señora Yolanda thanks the Virgin of Guadalupe for saving her husband David form dying during a dangerous heart surgery. He was hovering between life and death. 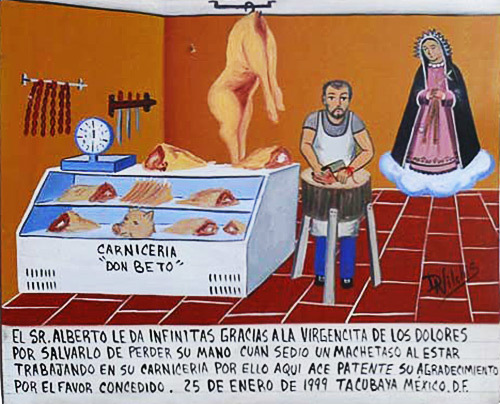 For your favor I offer you this retablo. 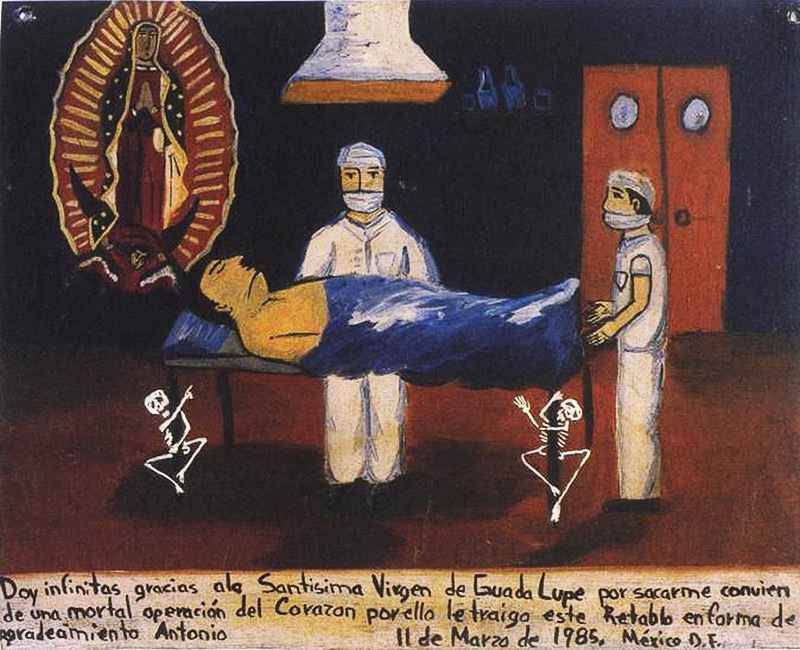 I’m infinitely thankful to the Virgin of Guadalupe because I came through a very dangerous surgery when I was between life and death. 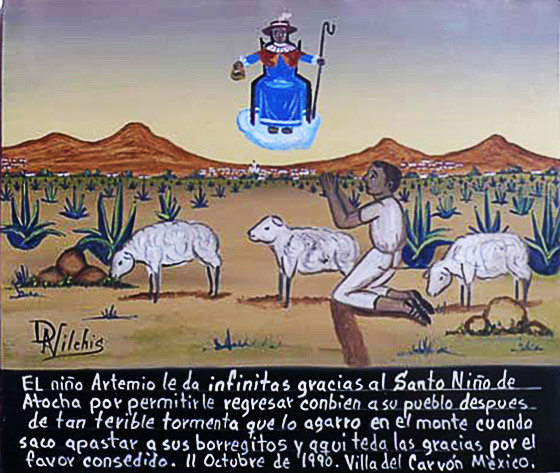 I bring this retablo. 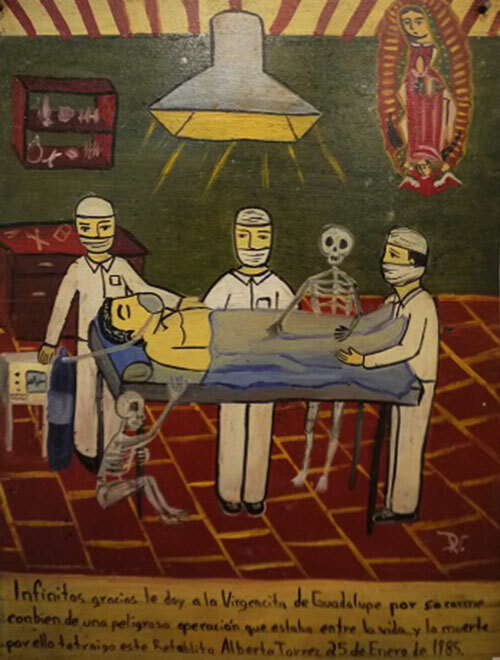 I thank the Virgin of Guadalupe because I survived a deadly surgery on my heart. 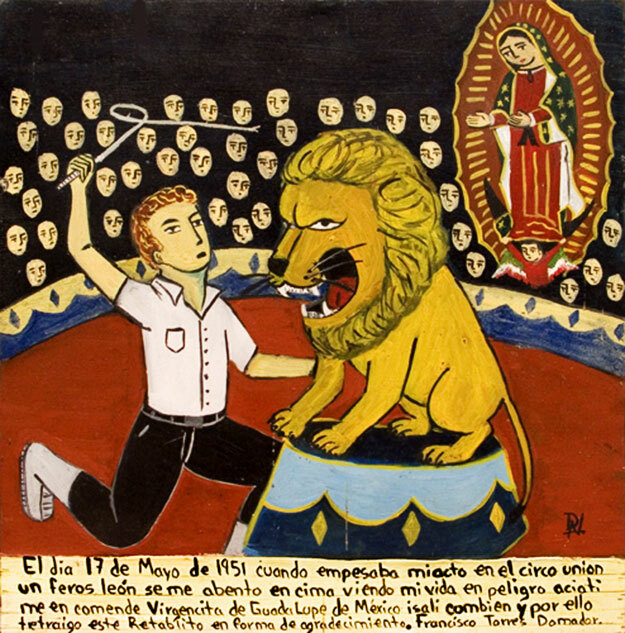 I bring this retablo as my gratitude. Thank you, Saint Jude Thaddeus, for saving me from this difficult and painful situation with my wife. She was about to leave me because I wasn’t able to satisfy her as a man. I prayed to you, and now she’s happy thanks to viagra. I started to take it and saved my marriage. 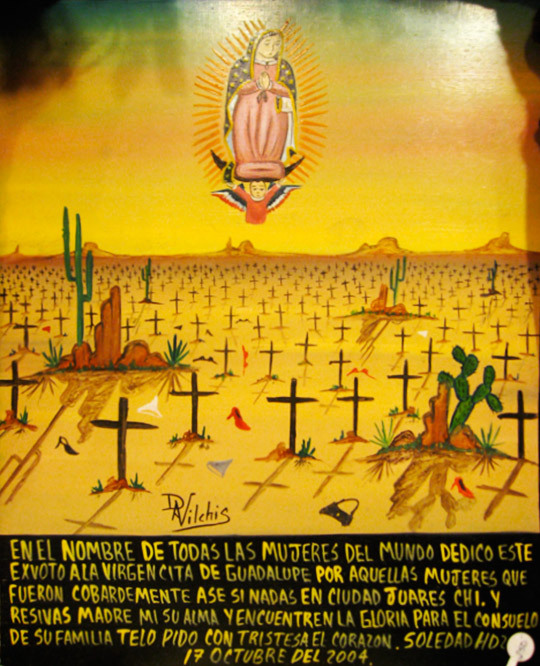 I thank the Virgin of Guadalupe for they didn’t shoot me when they mistaken me for a bandit leader Tito Hernandez who had rebelled against the government and dedicated himself to crimes and atrocities until the rural police sherif Juan Lobera’s people didn’t catch him.